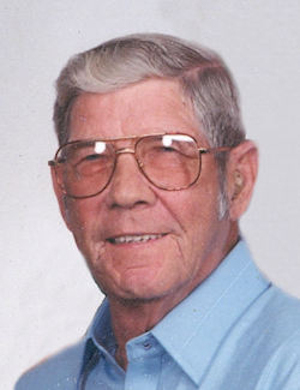 Obituary – Henry, Bobby Loraine « Perry High School Alumni Association, Inc.
Bob L. Henry was born to Irl and Verla (Oden) Henry on February 6, 1927, at Watchorn, OK and departed this life in Cedar Park, TX on May 26, 2009, at the age of 82 years, 3 months and 20 days. Bob grew up at Perry, OK. He joined the National Guard, serving his country honorably during the Korean War and was a Purple Heart recipient. After the War he attended college at Central State where he met and soon married Eva Joyce Beagle on October 26, 1953, at Deer Creek, OK. They made their home at Perry where Bob worked as a rural mail carrier. They eventually moved to Hennessey and later to Walters where Bob served as the golf course superintendent. Through the years Bob enjoyed playing baseball and golf, and was a fantastic coach of many sports including: little league baseball thru semi-pro, basketball, football and golf. He loved his family and OU. He enjoyed spending time with the grandkids, his son, Kirk, was his best friend and Eva was the love of his life—they were inseparable. Eva preceded him in death on April 13, 2006 and he was also preceded by two brothers, Don and Irl Henry and a sister, Verla Connelly. Survivors include a son and daughter-in-law, Kirk and Cathy Henry of Leander, TX; a daughter and son-in-law, Cindy and Bob Stauffer of Kentwood, MI; a brother, Ron Henry and wife Ethmer of Odessa, TX; a sister, Carma Austin of Mansfield, OH; 4 grandchildren Jeremy Lucas and wife Latasha, John Lucas and wife Justine, Savanah and Shelton Henry; 3 great grandkids, Jordan, Dillon and Noah Lucas; many other relatives and friends.